With the spirit of the Cracker Packers front of mind after the workshop, I am back in the studio working-up the design for the statue. I immerse myself – listening to the audio recordings of the workshop, watching the video and time-lapse, and looking at the photos. I can often be found chuckling to myself on hearing the stories again of what the Cracker Packers got up to on the production line, in the early days. 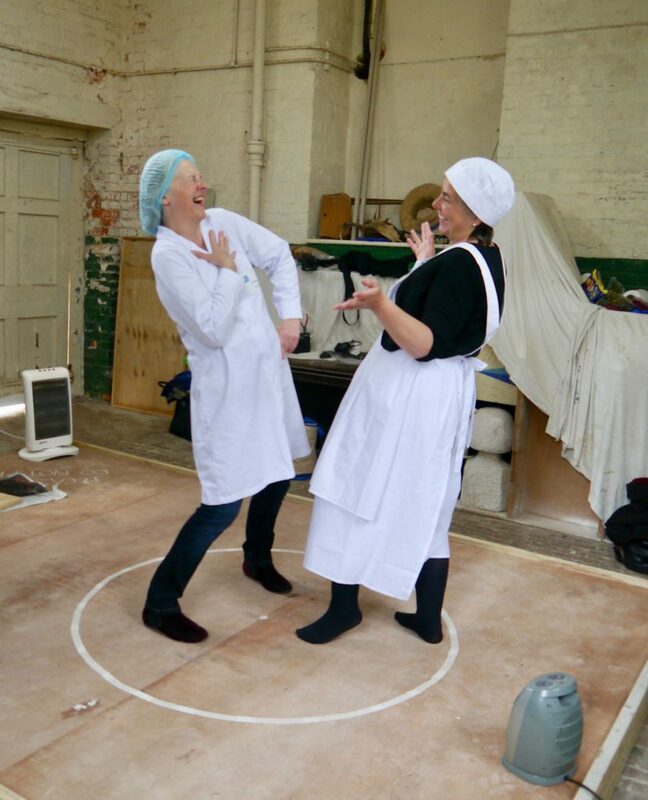 To explore the potential poses further, I call on my sisters – Sandra Reeves (left) and Jennifer Kafetz (right). They had assisted with the Cracker Packer workshop so are ideal for the job. They are incredibly pati ent with me pulling them around into different poses. 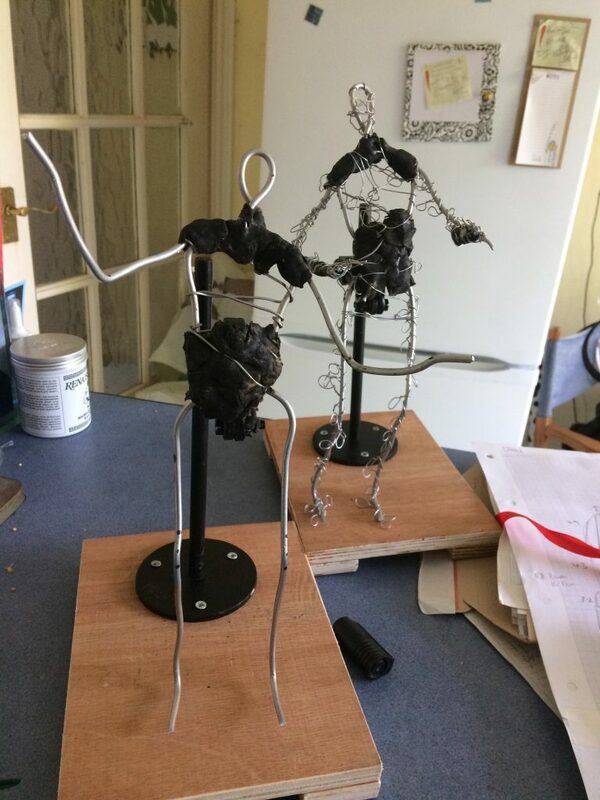 I create two small figure metal armatures, which I play with, testing out the poses and how they might work from every angle and direction. I’m pretty sure I now have the right pose that communicates the warmth, humour and camaraderie of the Cracker Packers. The woman from the olden days is relaying a funny story from her time on the production line, to the woman from the present day. I work in Plaxtin – a grey soft modeling material that does not dry-out. This allows me to still move the figures a little, to tweak the pose. 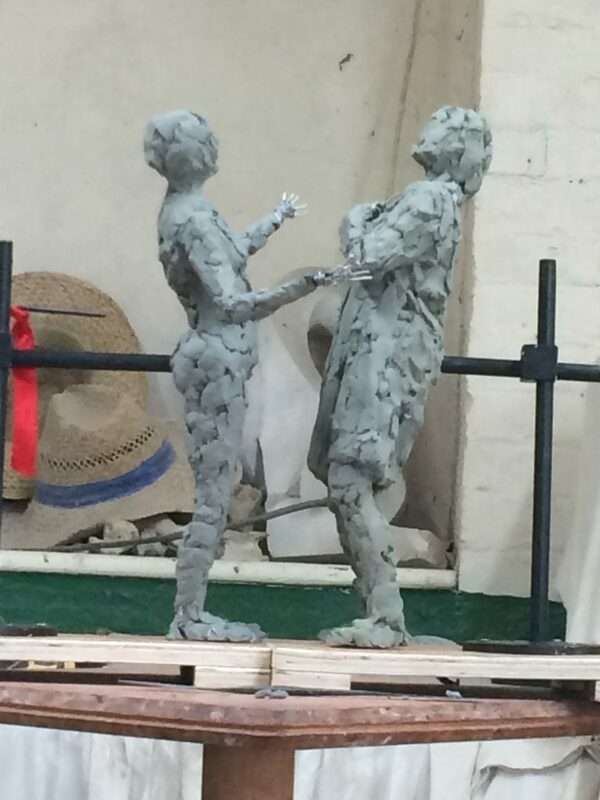 The pressure is on- I need to deliver my finished maquette to the selection panel in Carlisle. My ever-supportive sisters come back, one at a time, to model for each of the figures. 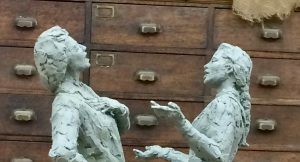 Here’s a sneaky snippet of the final maquette – it only needed to be fairly rough, for the panel to get a sense of the gesture of the statue.